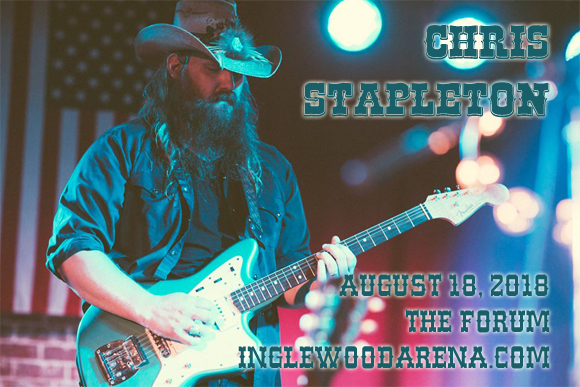 The unstoppable country music sensation Chris Stapleton will be performing at The Forum on Saturday 18th August 2018 as part of his All-American Road Show Tour! A continuation of last years tour, the All-American Road Show will see the Grammy Award-winning artist performing songs from his two volume From A Room album, as well as other fan favorites! He'll be joined for the evening by Marty Stuart & Brent Cobb! Upon moving to Nashville, Tennessee, Kentucky-born singer, songwriter and musician Chris Stapleton began to make his name in the country music world as a professional songwriter, and to date has over 150 songs appearing on albums by other artists, and has has co-written six country number-one songs by artists including Kenny Chesney, George Strait, Luke Bryan and Darius Rucker. Stapleton was the frontman of bluegrass band The SteelDrivers from 2008 – 2010, receiving three Grammy Award nominations for songs from their debut album. After leaving the band in 2010 in order to spend more time with his family, Stapleton formed The Jompson Brothers, who he toured with until 2013, when he signed to Mercury Nashville as a solo artist. Stapleton's solo debut, Traveller, was released in 2015 to rave reviews and huge commercial success, launching him to mainstream success. To date, Stapleton has won five Grammy Awards, five Academy of Country Music Awards, seven Country Music Association Awards and two Billboard Music Awards, among others.